Do you love local foods? Want to get more involved with the market and the Northside Community? Volunteer with NFM! As a non-profit, we rely on volunteers to help us keep the market thriving. Join the market community-you'll have a blast and support an organization that you love! Help our "Another For A Neighbor" program get fresh healthy foods to those in need. The farmers market partners with Churches Active In Northside's Food Pantry each week to collect produce donations from customers and farmers for distribution at the food pantry. You'll manage the donation collection booth, gather donations from farmers at the end of the night, and help get donations to the food pantry located a few blocks from the market. This volunteer opportunity requires a commitment of being at the market from 3:30-7:30pm. Assist with children’s learning activities at market, and help get kids more involved with the local food community and eating healthy. Help on market days between the hours of 3:30-7:00pm, or behind the scenes. Help us talk with customers and learn how to make the market better. Conduct simple surveys at the market between the hours of 4pm-7pm. Assist in making the market's special events run smoothly. Help out during the whole event, or take a 1.5 hour shift. Assist with taking down the market info booth and signs on Wednesdays from 7p-8pm after the Market. 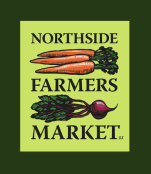 ​If if you are interested in volunteering, please email us at northsidefarmersmarket@gmail.com.